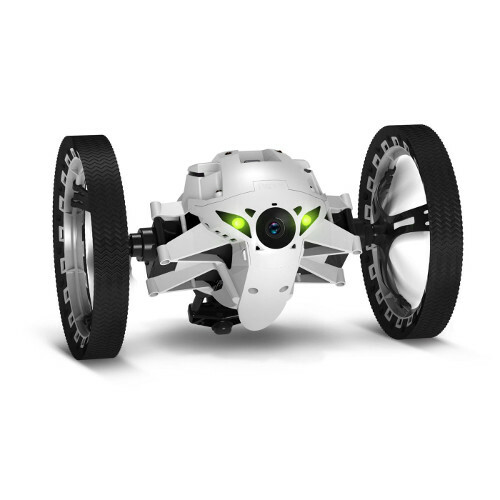 Piloted via Wi-Fi 2.4 or 5GHz with a Smartphone or a tablet, Parrot Jumping Sumo is a new genre of connected robot. Half robot, half insect, it is equipped with a gyroscope and an accelerometer, which provides fool-proof agility and intuitive piloting. It can roll, turn 90 degrees with speed and astonishing precision - meaning no obstacle is too challenging - and also perform spectacular jumps (up to 80 cm) always landing on its "wheels"! With an embedded camera, its acrobatic and fast-paced movements are streamed onto the screen of the controlling Smartphone or tablet.